Juice Beauty Firming Body Moisturizer Reviews: Should You Buy It? Juice Beauty Green Apple Firming Body Moisturizer Review : Ingredients, Side Effects, Detailed Review And More. What Is Juice Beauty Firming Body Moisturizer? 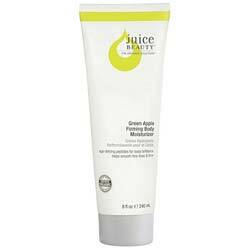 Juice Beauty Green Apple Firming Body Moisturizer, is a moisturizer that delivers a smoothening and tightening effect on skin, and more. Juice is a brand that wants to build a reputation as a company that delivers beauty products that work and made only from safe, non-toxic ingredients. However, the company has formulated the product with alcohol which may cause skin dryness. What Are the Ingredients In Juice Beauty Firming Body Moisturizer? Jojoba: Leaves the surface of your skin comfortably hydrated as it seeps to deeply nourish from within. This oil has a tendency to cause rashes and allergic reactions, especially on sensitive skin. Malic Acid: Derived from organic green apples, this ingredient functions as a skin brightener. Some people have experienced redness, itching and skin irritation upon using products with this ingredient. Essential Fatty Acids: Have anti-inflammatory properties that help heal damaged skin as well as soothe skin from irritations, allergies, redness, swelling and other signs of inflammation that can lead to permanently damaged skin. Aloe Vera: It reduce skin inflammation. Aloe is used to effectively heal chronic skin problems, such as psoriasis, acne and eczema. Apply generous amounts of Juice Beauty Green Apple Firming Body Moisturizer all over your body, as part of your day time and night time skin care routine. This product has been specially formulated to help restore the health, vitality and elasticity of mature, aging skin, including those with dry to normal skin types. This product is loaded with ingredients that, together, make this product perform multiple functions and deliver multiple benefits. Although Many user reviews say it isn’t very effective. Juice Beauty Firming Body Moisturizer reviews have repeatedly raved about this product’s refreshing smell. The manufacturer expressly does not recommend this product for use by people with sensitive skin. This product will have mild to moderate anti-aging benefits given the limitations posted by this product’s formula. Juice Beauty Firming Body Moisturizer reviews posted by users who claim that they have sensitive skin have reported experiencing allergic reactions. Some users feel that the product is not well absorbed by the skin. There are some users who have compared the scent of the lotion to that of a bug spray. Juice Beauty Green Apple Firming Body Moisturizer is perfectly capable of giving you a silky smooth and cotton soft feel on your skin with daily, long-term use. While it is formulated to perform skin firming action, it may not be able to deliver any dramatic benefits that will make you notice tighter skin under your arms or, a less wrinkled knee joint any time soon. Fairly priced for quality if this is the level of performance you need from your body lotion.